Imagine if the people who made James Brown dance, Kool and the Gang “Celebrate”, and PFunk’s Mothership fly, all joined forces with some of todays greatest talents for a timeless one of a kind collaboration. This exists, and it’s called THE BIG OL’ NASTY GETDOWN. THE BIG OL’ NASTY GETDOWN started as a star-studded tribute to the history of Funk, Soul, R&B, Jam and Hip Hop. Members of Parliament Funkadelic, Bootsy’s Rubber Band, Galactic, Dumpstaphunk, Blackalicious, Derek Trucks Band, Dirty Dozen Brass Band, Yo Mama’s Big Fat Booty Band, The Lee Boys and Warren Haynes Band, united in late 2007 to create the sonic landscape that became The Big Ol’ Nasty Getdown “Volume 1.” Released in 2012, “Volume 1” received global acclaim which paved the way for the next chapter, “Volume 2.” Currently in production, “Volume 2” continues in the same tradition with an expanded lineup that now includes members of The James Brown Band, Kool and the Gang, Earth, Wind and Fire , Living Colour, Arrested Development, Fishbone, Mudvayne, Bill Wither’s Band, The Time, Sexual Chocolate Band, The Mike Dillon Band, and Tiny Universe. More info coming soon! “It’s quite extraordinary what they have put together and I’m honored to be a part of this project” says Taylor Dayne. “These are some of the biggest, baddest, greatest Jazz, Funk, Blues, players out there, and what can I say?… I’m a part of Volume 2, it’s very exciting!” Combining household names such as Taylor, Speech, Karl Denson, Fred Wesley and George Clinton with emerging stars like Soulful South African native, Laura Reed and the devil throated Reverend Desmond D’Angelo, the Getdown fuses nasty grooves with the freshest and most potent musical flavors, creating their timeless sound. Says Heintz’s production partner Frank Mapstone. As The Getdown prepares for their tour and completes Volume 2, Producers Heintz and Mapstone are releasing a multicolor 180 gram, Vinyl collector dream of “Volume 1.” The production duo also have a couple new projects in the works that are extensions of the Big Ol’ Nasty Getdown. These include The Big Ol’ Nasty Hoedown ‘Volume 1’ an album that focuses on the Bluegrass, Country and Folk side of things, while ElectroGetdown will cater to the EDM movement. 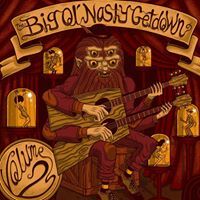 It has also been confirmed that “Volume 3” will immediately go into production upon the release of The Big Ol’ Nasty Getdown “Volume 2” album.